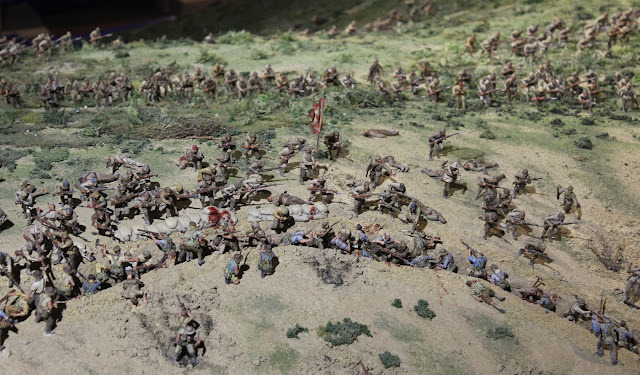 This blog was originally set up in 2015 to support an ambitious World War One commemorative project, in which 140 New Zealand volunteer wargamers painted 5,000 miniature soldiers for a huge diorama of the Battle of Chunuk Bair for The Great War Exhibition in Wellington. The project was successfully completed and the diorama opened in May 2015. The exhibition closed on 2 December 2018. 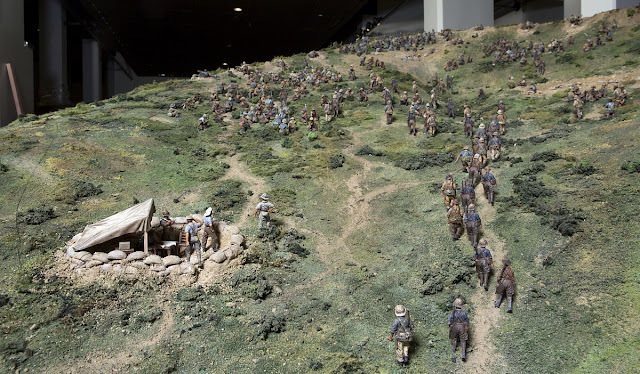 This blog is being kept alive as a historical record of the process to create this remarkable diorama. Have a browse to see how this blog was used to organise so many volunteers spread all over the country in a group effort to paint the figures authentically, consistently and by the tight deadline. Here are some photos of the ceremony to close The Great War Exhibition, including the Chunuk Bair diorama, which took place last Sunday (2 December 2018). Our Armchair General, Rhys Jones, tells the gathered guests the story of the project. 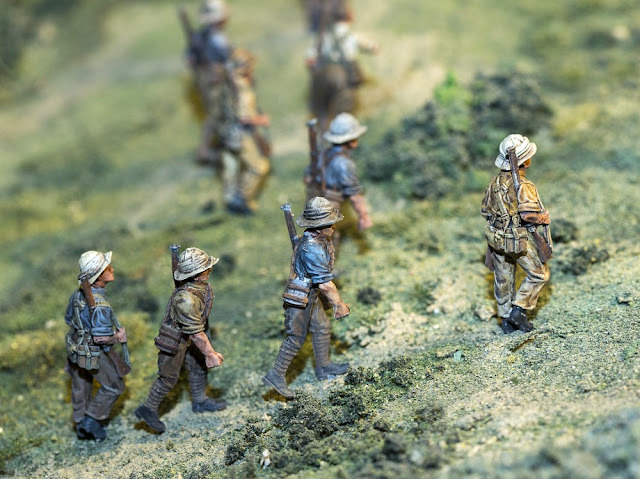 The final group ever heads up the passage of coloured photographs towards the diorama. A Māori kaumatua (elder) led the group around the exhibition 'putting it to sleep'. 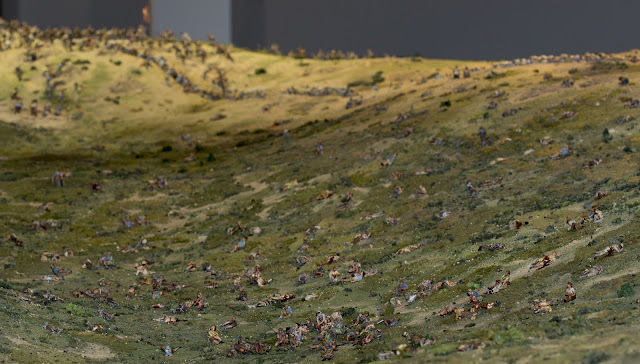 A final glimpse of the Chunuk Bair diorama. 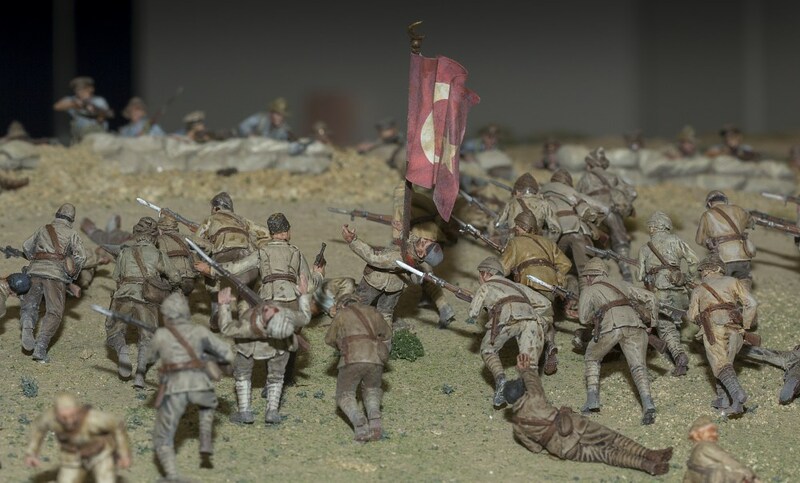 At 6.00 p.m. today, Sunday 2 August 2018, The Great War Exhibition, including the Chunuk Bair diorama, will close its doors for the last time. 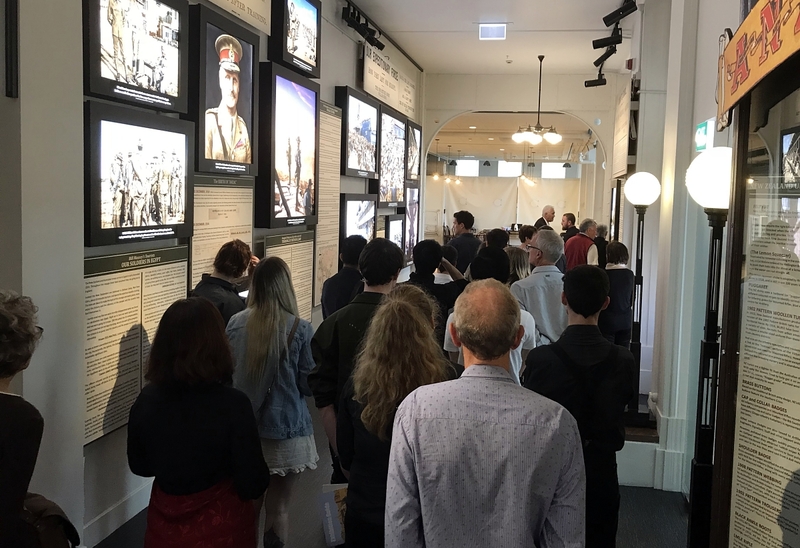 The Great War Exhibition was designed in 2015 as a temporary exhibition, to be open for the duration of the First World War centenary, and to close some time after the November 11th Armistice Day ceremony in 2018. Today marks the final day. Our Armchair General, Rhys Jones, will be attending the formal closing ceremony this evening, where he'll talk to the invited guests about the creation of the exhibition, including the diorama. "The good news is that there is plenty of interest in parts of the exhibition, including the diorama, being moved to another location," says Rhys. "We remain positive that the diorama will again be on display in the near future." 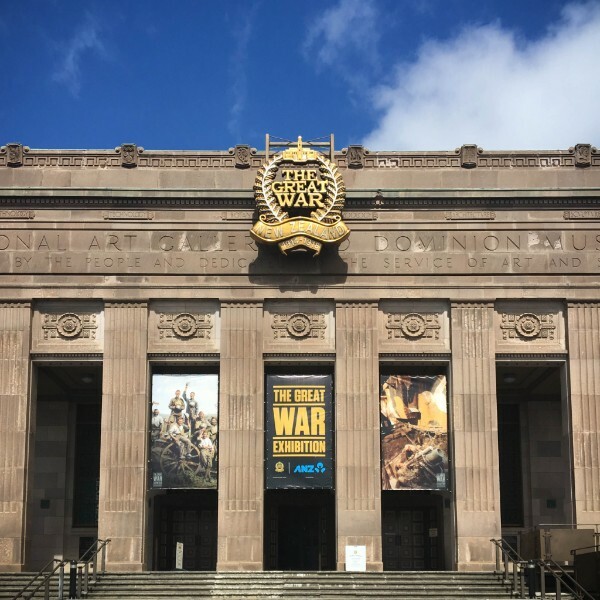 The Great War Exhibition has been a real success, being the second-highest rated attraction in Wellington on TripAdvisor, after Te Papa. "We had also been offered to be put in Lonely Planet," says Rhys, "but had to turn that down as we were closing." 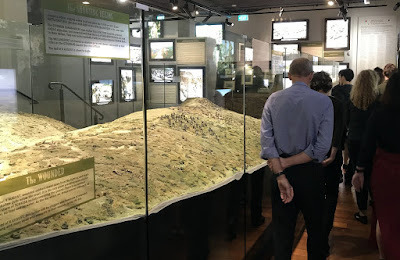 Rhys says that the exhibition has been an impressive tribute to the soldiers of The Great War, and the Chunuk Bair diorama was a key part of that success. "A (semi) final thank you to everyone who contributed to the creation of the diorama - be it painting and/or constructing the terrain. What an amazing effort to do all that in less than three months!" There's more information about the closure of The Great War Exhibition here and here. 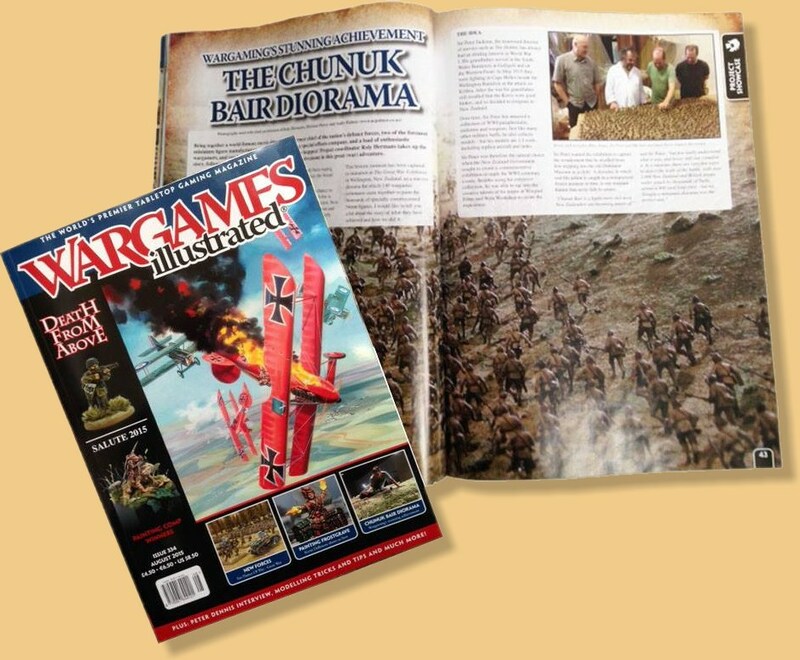 'Wargames Illustrated' articles about Chunuk Bair diorama - in full! 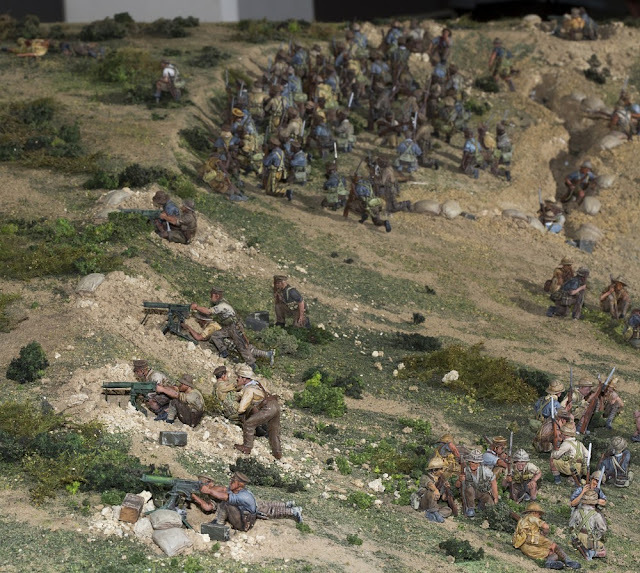 To mark Anzac Day, you can now download two illustrated articles describing the amazing story of last year's massive Chunuk Bair diorama project for The Great War Exhibition in Wellington. 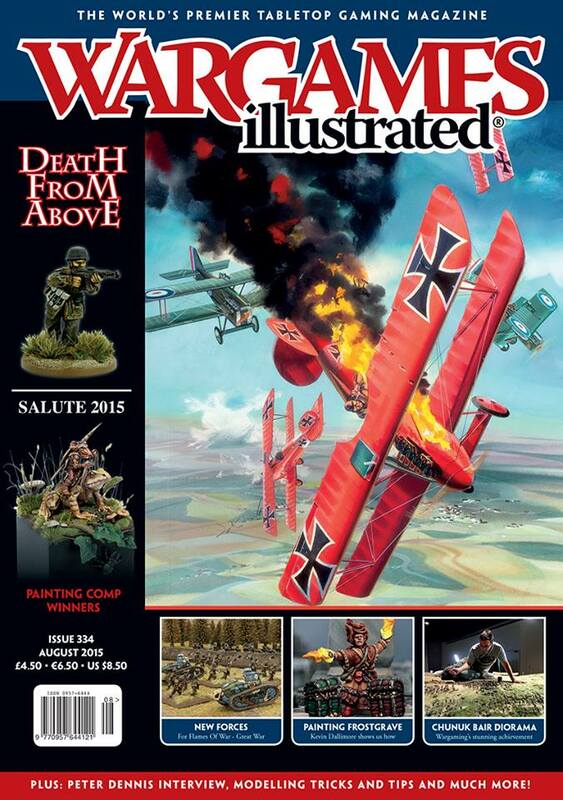 The publishers of Wargames Illustrated have kindly agreed to let us post in full these two articles that first appeared in their August 2015 issue. 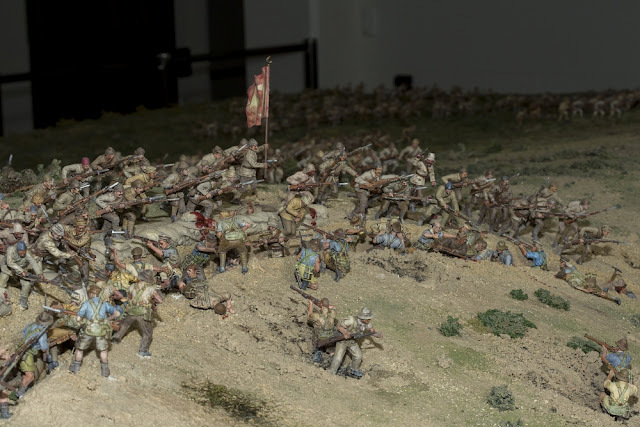 Wargaming's Stunning Achievement: The Chunuk Bair Diorama describes how the project was conceived, and how the wargaming community throughout New Zealand joined together to paint thousands of figures within a very tight schedule. 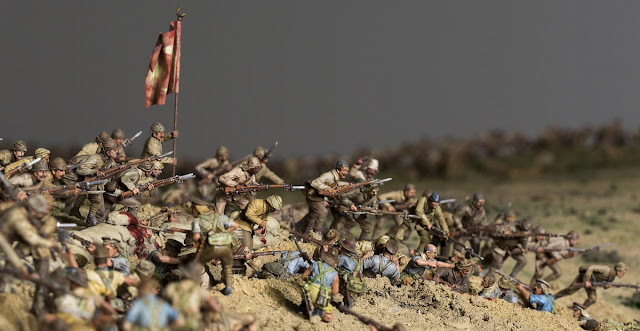 The Perry Perspective was written by Michael Perry, one of the famous Perry twins, the British sculptors engaged to produce the figures for the diorama. 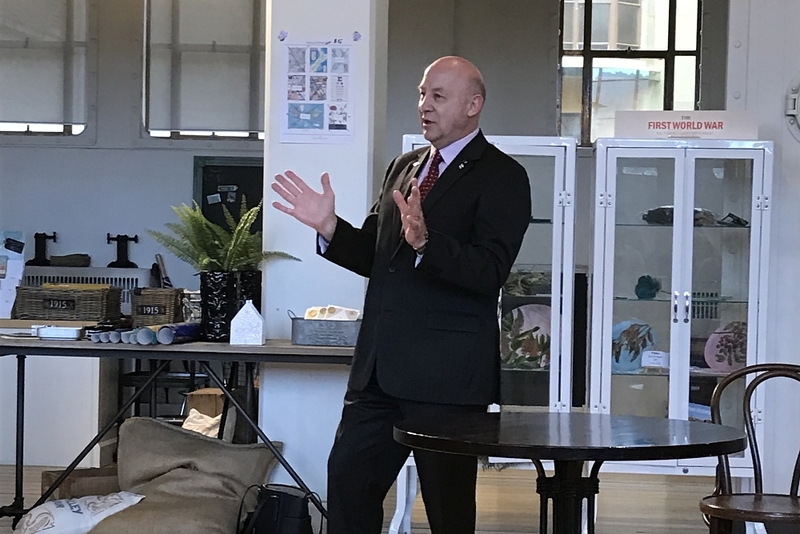 He provides his fascinating insight into how this unique project came together, and the adventures they had in New Zealand to get everything done in time. Download the PDF file containing both these articles [8.51MB]. 25 April is an innovative feature documentary created to bring the story of the New Zealand experience at Gallipoli to life for a modern audience through a re-imagined world. 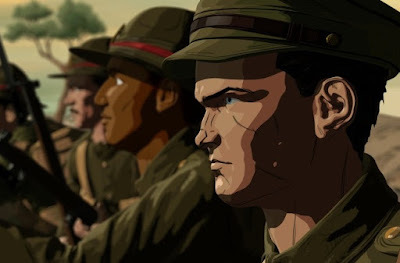 Using graphic novel-like animation, 25 April brings First World War experiences out of the usual black-and-white archive pictures and into vibrant, dynamic color. Weaving together animated "interviews" based on the diaries, letters and memoirs of six people who were actually there, the film tells the compelling and heart-wrenching tale of war, friendship, loss and redemption using the words of those who experienced it. 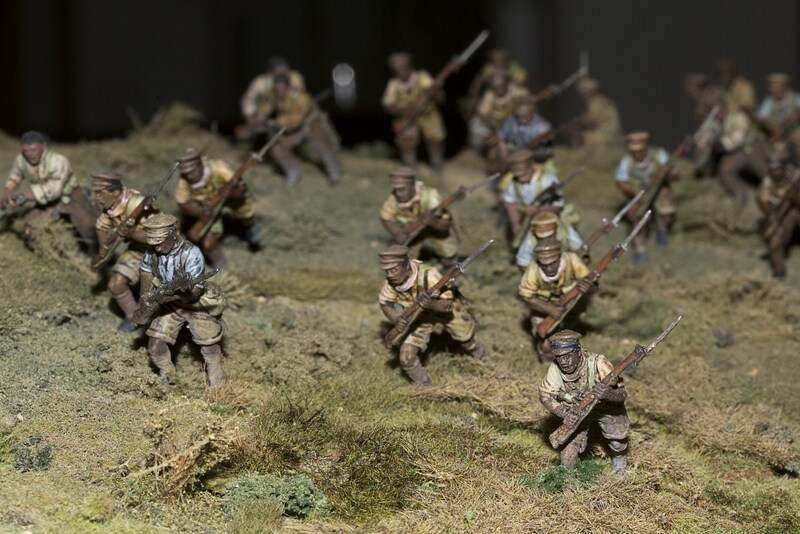 In our round-up of articles during the development of the Chunuk Bair diorama, we somehow missed this item in the April newsletter of the Wellington Branch of the International Plastic Modellers Society (Wellington branch) newsletter [PDF 3.3MB]. In a well-written article starting on page 8 of this newsletter, Richard Alexander relates how he painted sixteen figures for the diorama. He describes the unusual technique he used for painting the figures using an airbrush. One of Richard's figures is the saluting officer in the command dugout at The Apex. Tomorrow marks exactly one hundred years ago that the events portrayed in our diorama actually took place. 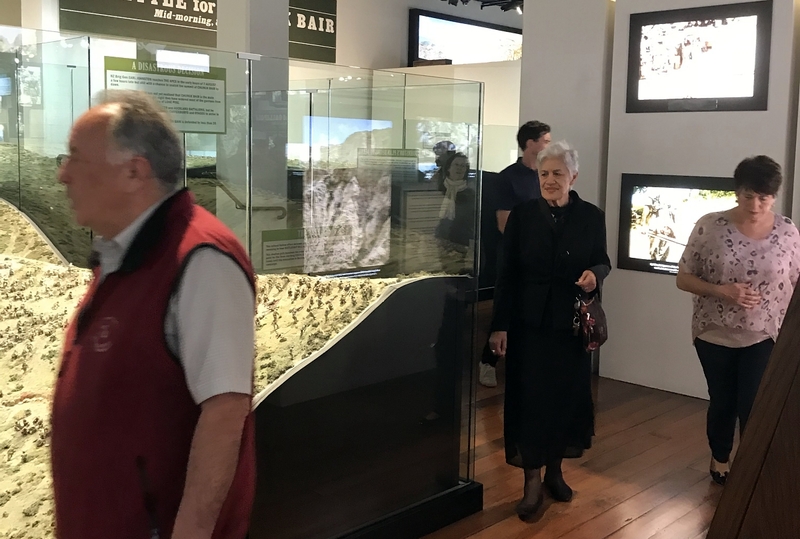 The national ceremony to mark the centenary of the battle for Chunuk Bair will take place at 4pm tomorrow at Pukeahu National War Memorial Park in Wellington. 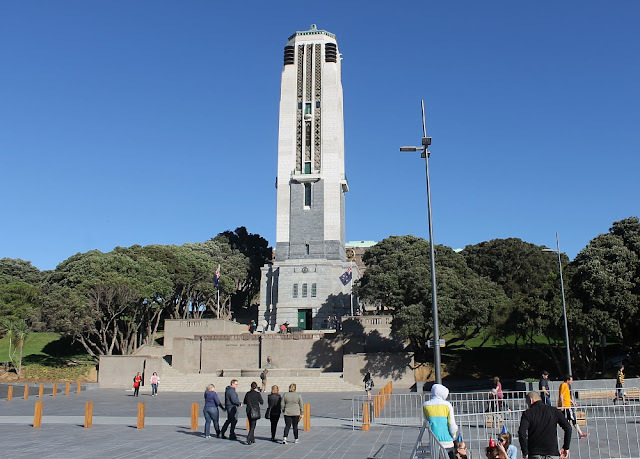 There will be readings, choral interludes, wreaths will be laid at Tomb of the Unknown Warrior honouring the fallen from New Zealand battalions, and the ceremony will be concluded with a playing of the Last Post. Aziz Sevi, Chargé d’Affaires, Embassy of Turkey. The RNZAF Band plays “Nightfall in Camp”, including “The Last Post”. The September issue of Toy Soldier and Model Figure magazine features a photo article about our diorama. Below is one of the many fabulous pictures featured in the magazine. 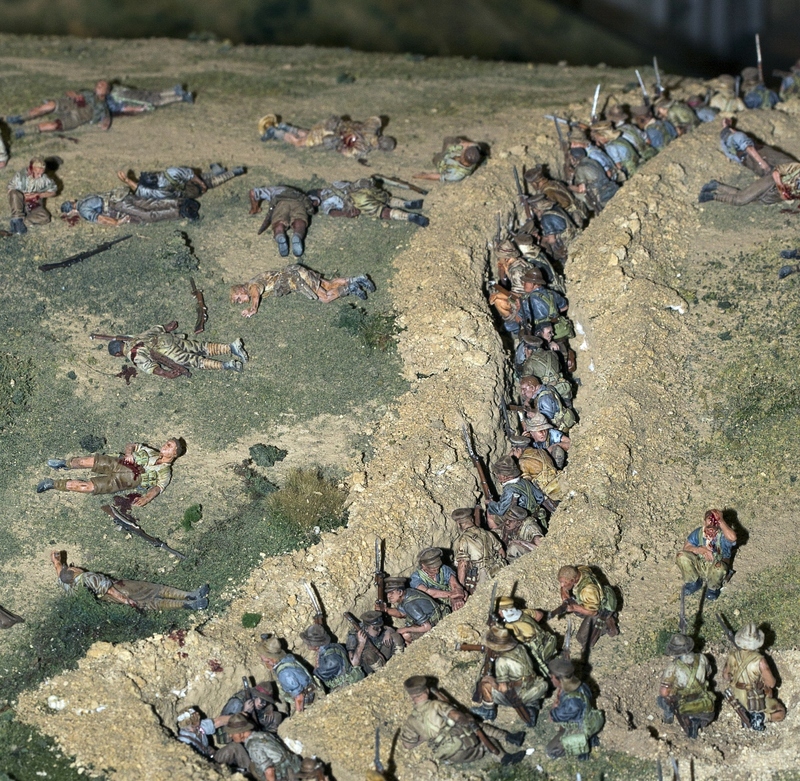 Whilst we've previously posted quite a few photos of the diorama of the Battle of Chunuk Bair, we've saved the very best shots until last! We had agreed to withhold these photos until after Wargames Illustrated published a photo-article about this project. Now that this article is in their August issue, we can at last show you these amazing shots taken by Andy Palmer. Some of these pictures appear in the article, but others are exclusive to this blog. We strongly suggest you click on each photo to enlarge and get the full effect of these amazing pictures. 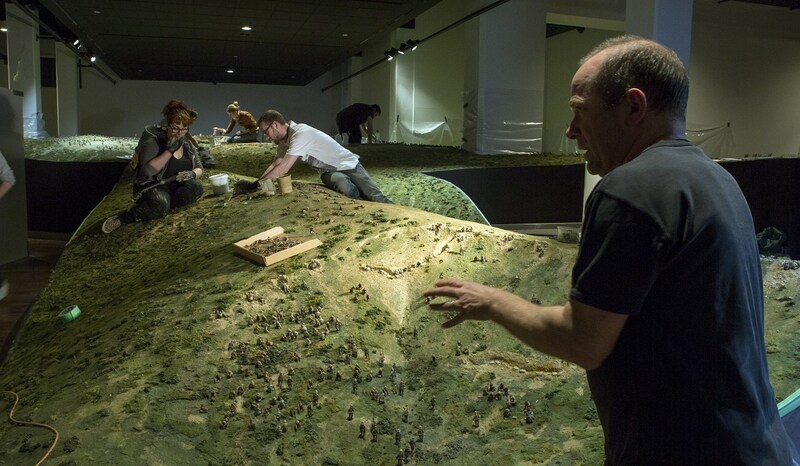 This picture of Michael Perry and some Weta Workshop staff during the production of the diorama gives a hint of its sheer size, even though you still can't see it all here. Michael is working on The Apex in the foreground, the two staff in the middle distance are sitting at The Pinnacle, and way off in the distance two other staff are populating the trenches on Chunuk Bair itself. 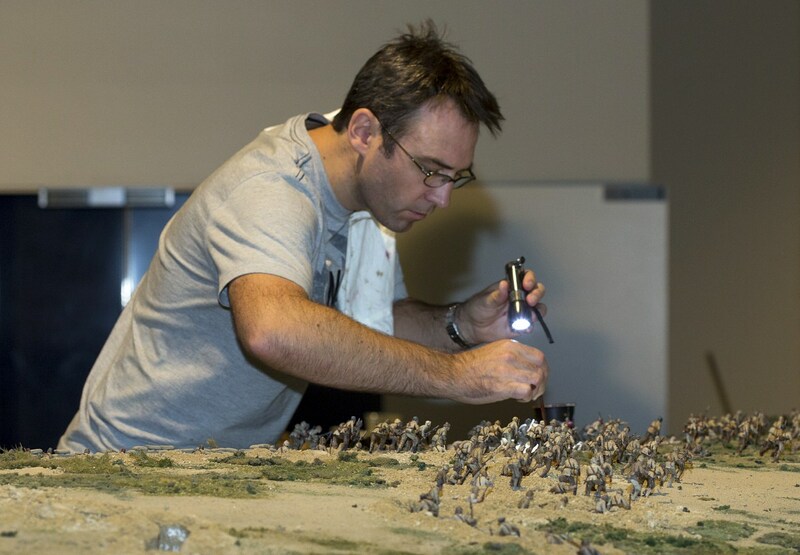 A Weta Workshop staff member carefully applies some finishing touches to the diorama. Before the final lighting was fitted, the modellers had to work in dusk-like conditions. The first part of the diorama that visitors see is The Apex, which includes the command dugout, the amassing Anzac reinforcements, and resting survivors of previous assaults on Chunuk Bair. Here's a closer view of the command dugout. 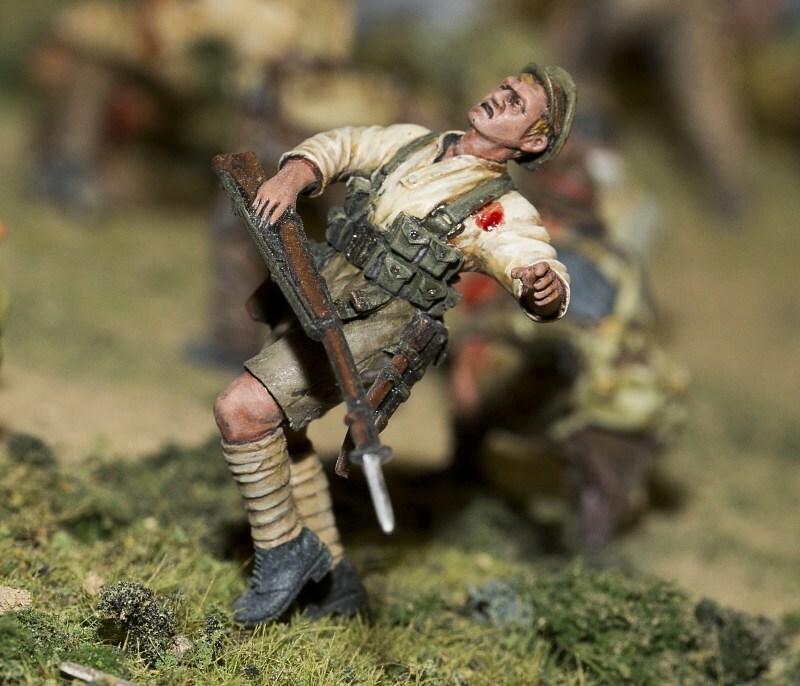 Two points of interest are the telephone wire snaking out at the left (more about this wire in a picture further down), and the despondent and likely drunken Brigadier Johnston sitting with his head in his hands (there's a humorous story about this particular miniature in the Wargames Illustrated article). Making their way up The Apex are the Auckland Mounted Rifles, part of the reserves moving forward to reinforce the summit. Sir Peter Jackson is of course well-known for making cameo appearances in his movies, and it is no different with this diorama. Here you can see him as a battlefield photographer at The Apex. Along the crest of The Apex are situated the massed New Zealand machine gunners, under the command of Major Jesse Wallingford (standing centre left). The massed New Zealand machine guns wreak havoc on the flank of the Turks counter-attacking Chunuk Bair from their trenches on Battleship Hill. 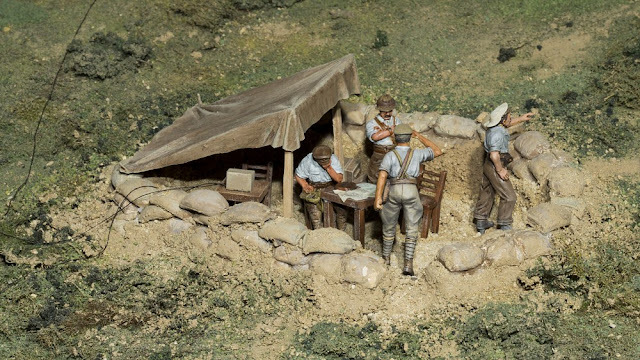 Forward of The Apex along Rhododendron Ridge is The Pinnacle, where survivors of a previous assault on Chunuk Bair by the Auckland Infantry huddle in an abandoned trench or dig in to protect themselves as best they can. Beyond The Pinnacle, members of the Maori Contingent push forward, but are forced by heavy Turkish fire down the left of the ridge towards The Farm. In this picture you can see the different levels of painting styles, colours and skills, and how they all meld together into a homogeneous whole. Halfway up the slope of Chunuk Bair is the lonely figure of Corporal Cyril Bassett dragging the telephone wire that we first encountered in the earlier picture of Brigadier Johnston's command dugout. For his brave actions in opening and maintaining communications, Bassett was awarded the Victoria Cross. This may be the most amazing photo of the lot, in a terribly sad and poignant way. It shows hundreds of wounded New Zealanders and British gathering in a sun-scorched valley beneath the summit of Chunuk Bair, where many lay unattended for days. If nothing else brings home the horror of this battle, this picture does. Even Corporal Bassett's telephone line can be seen snagging on the casualties, as it actually did. Just beneath the trenches on top of Chunuk Bair is Lt Col William Malone's little command trench. He led the Wellington Infantry to capture the Turkish trenches almost unopposed before dawn, and then commanded the desperate efforts to hold Chunuk Bair against the massed counter-attacks. He was eventually killed by friendly fire from artillery or a ship. 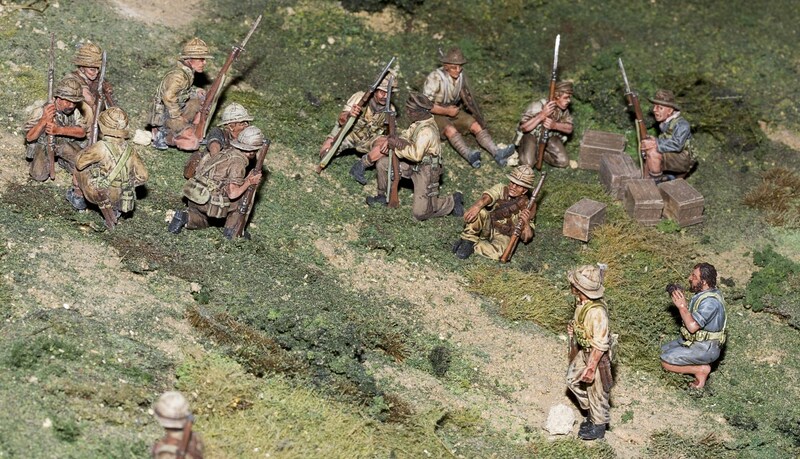 To the left you can see some British infantry beginning to fall back, a few being forced to rally at gunpoint. On top of Chunuk Bair, we see one of the many charges by Turkish infantry, as they attempt to wrest back control of the captured trench. Another shot of the Turkish counter-attack. You can even see hand-to-hand combat occurring in the trench. Also note the blood - Sir Peter Jackson had read many first-hand accounts of how bloody the battlefield became, and so he wanted the team to not spare on adding blood to the diorama. New Zealanders rush along the line to reinforce fighting further along the line. The grey-haired chap in the middle is a special model that the Perry twins sculpted of the author. Though how many soldiers at Gallipoli were actually old enough to have grey hair ...? Here's another rush of Turks towards the New Zealand position. Again, see how the various shades of the Turkish uniforms work really well to give a ragged campaign look. You can see the difficulties of the New Zealanders in their trenches (top) as they face waves of Turkish counter-attacks, let alone enfilading fire from Battleship Hill and Hill Q on each side. The cost of battle - a wounded Turkish soldier is escorted back down the hill. Two unfortunate Turkish soldiers in a heart-wrenching little vignette. A New Zealander is shot. 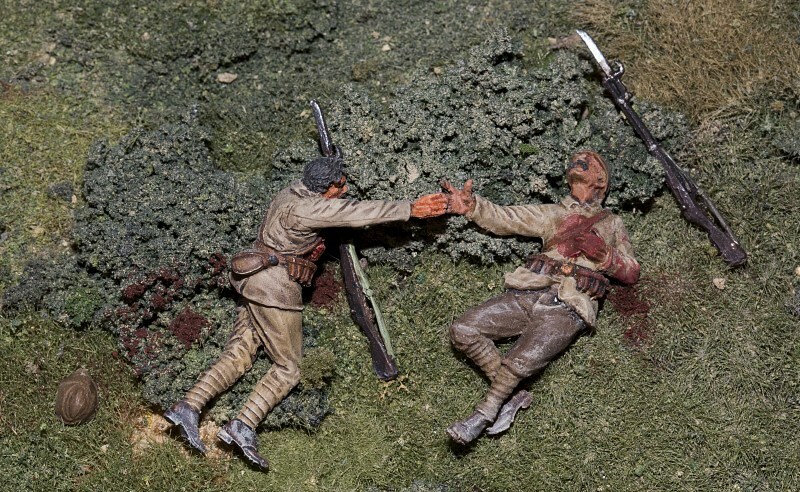 The volunteer painters found painting the hundreds of wounded figures a very emotional task. Another look at this amazing but horrible shot. If you haven't enlarged any other of these pictures by clicking on them, you've just got to enlarge this one - never in any diorama have we seen the cost and horror of battle so dramatically conveyed. Chunuk Bair diorama in 'Wargames Illustrated'. Can't wait to see how this article and the photos have turned out. Has anyone seen it yet? Everyone working on the Chunuk Bair diorama would have quickly become aware of one of the great characters of that battle, Lt Col William Malone, commanding officer of the Wellington Infantry Battalion. 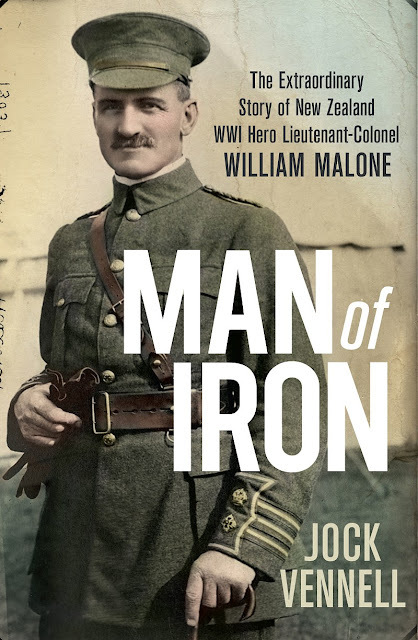 Man of Iron, by Jock Vennell, the first biography of one of New Zealand's best known First World War soldiers. Lieutenant-Colonel William Malone is one of New Zealand's best-known First World War soldiers, having held off fierce Turkish counter-attacks for nearly two days before being killed by a shell from a British warship. 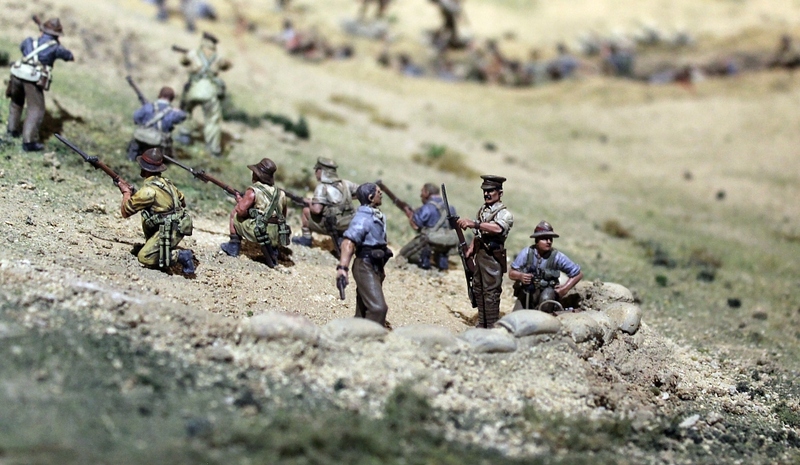 The defence of Chunuk Bair has been described as one of New Zealand's finest hours. Malone and his men captured and held the heights of Chunuk Bair on the Gallipoli Peninsula in August 1915. Historian and author Matthew Wright has posted his impressions of the Chunuk Bair diorama on his blog today. His posting includes some great photographs, too. One of Matthew's books, Shattered Glory (Penguin 2010), is about New Zealand's human experience during two First World War campaigns, including Gallipoli, "exploring the darker side of New Zealand's iconic symbols of national identity and explaining some of the realities behind the twenty-first century mythology". It’s 200 years today since the Battle of Waterloo. 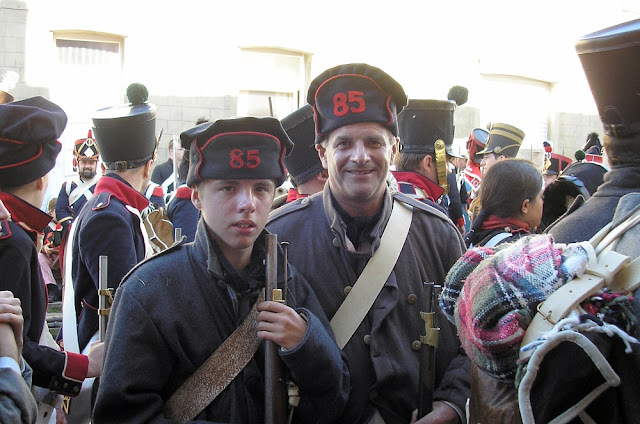 It’s therefore apt to post this link to my 2012 article about myself and my son’s experience ten years ago at the 2005 reenactment of Waterloo. 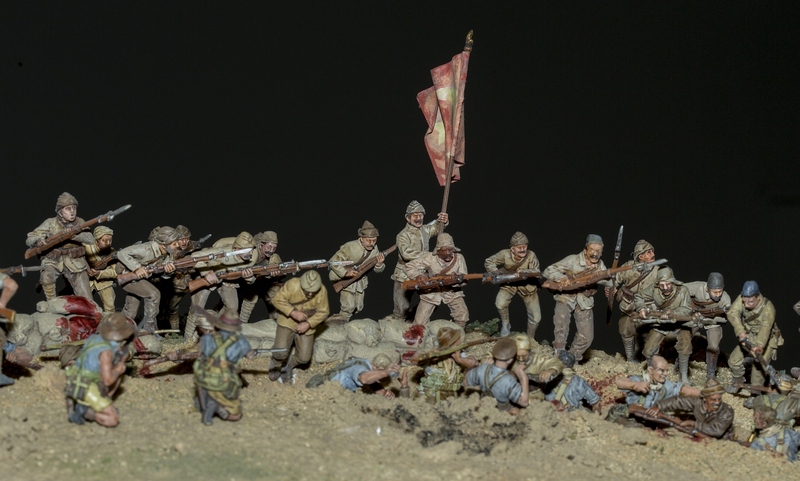 Our Chunuk Bair diorama is the subject of an article in the latest issue to the Taiwanese magazine Illustrated Guide for Weapons & Tactics (Chinese: 中國之翼.兵器戰術圖解~ 軍事圖書.雜誌專賣店). This is one of the main periodicals about military issues and war history in Taiwan. Recently they've been covering some history of the Great War, for example about the Ottoman armed forces and their efforts during WWI, to show their Taiwanese readers a broader view of the Great War than the trench warfare of the Western Front. So when the editor stumbled across pictures of our diorama, he contacted us about running some photos in his magazine, and telling the story of Gallipoli and the armed forces of both sides. Here is the front cover of the magazine. The red text near the top describes this issue's special feature. These Chinese characters literally mean "The 'Lord of the Rings' Style Gallipoli Battlefield", but a more accurate meaning might be "The Gallipoli Campaign Diorama Created by (the Idea from) the Team of 'Lord of the Rings'". 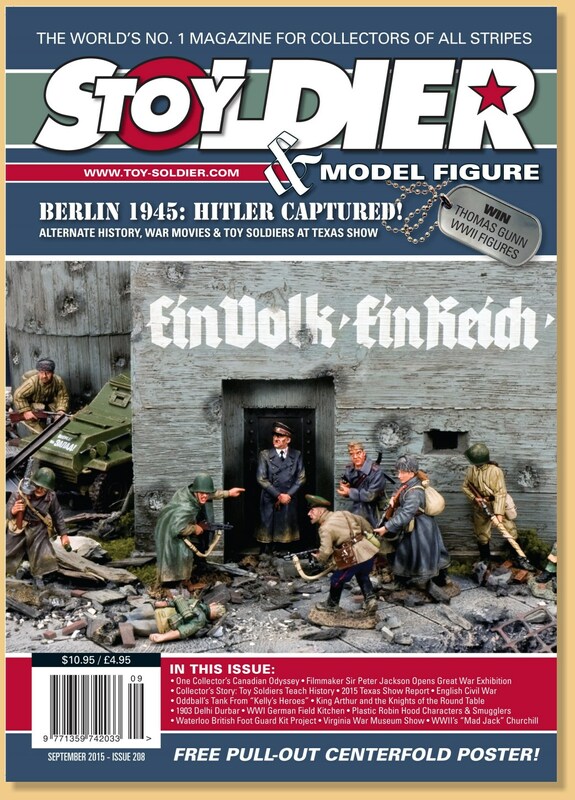 As you can see from the pictures on the Contents page, the magazine covers a wide range of topics. Our article occupies a chunk of pages near the middle. 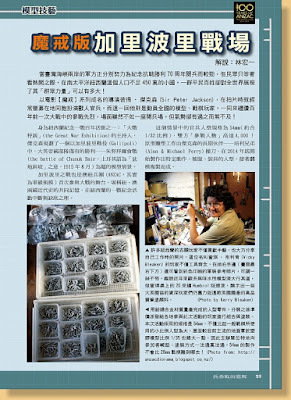 One of the pages includes a picture of volunteer painter Vicky Bleaken at work on her batch of figures. When he noticed the Humbrol cans on her table, the editor wrote, "some modellers of the Commonwealth still use this great British brand enamel paint!" Overall. 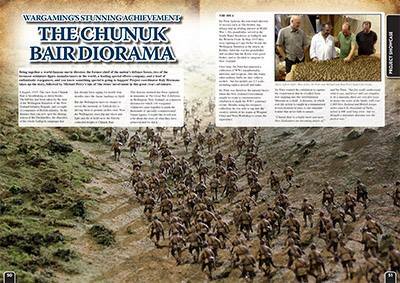 it is wonderful to see the continuing international attention our diorama of Chunuk Bair is attaining.